After skinning my knuckes (twice) I’m now self-certified in the use of an electric drill and circular hole cutter to cut holes through steel. 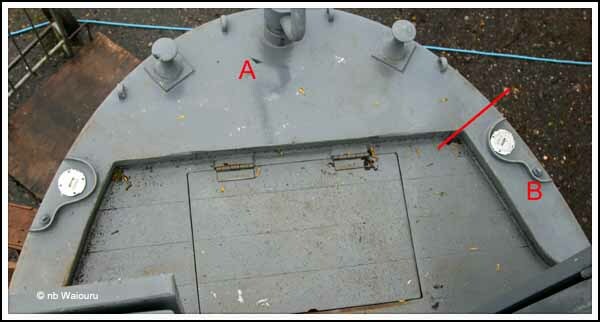 Waiouru was delivered without the filling point holes in the various tanks, which was a very good thing as it avoided the possibility of contamination and rust. The filling point holes would need to be cut at some stage during the build, so I volunteered to do the job. In addition to the drill and hole cutter, Andy also gave me the chrome plated tank fittings. He suggested I should cut the extended stem off the fittings as it can create an air pocket in the top of the tank. This frequently causes the the diesel (or water) to squirt out around either the nozzle or air valve during the final phase of the filling process.. I took his advice and duly cut the extension off with a hacksaw. 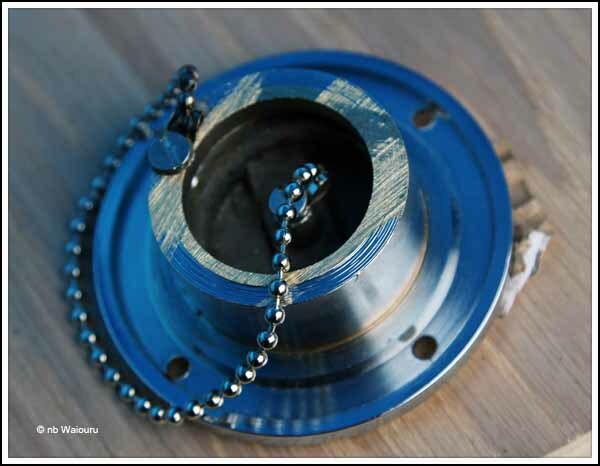 However the filler cap was connected to the base by a chain. Unfortunately the base end of the chain was connected to the section I had cut off. The chain could have been discarded but that seemed a waste, so I came up with a solution. I drilled a 3.6mm hole in the base of the flange and then used a 4mm tap to give me a thread. The chain was then secured to the base with a 4mm machine screw. I suspect the chain will eventually fail but we are at least starting with it intact. You may have noticed the fittings are all chrome. The plan is for most of the exterior fittings to be either stainless steel or chrome. No brass polishing for me!!!! One other fuel question has now been resolved. We had specified Waiouru was to have two diesel tanks at the rear. However it wasn’t apparent where the dividing wall was between the tanks. Andy mentioned the fuel connection for a Beta engine was on the starboard side so we were hoping Wilson-Tyler had made the port tank smaller. And they had! Well done Tyler-Wilson! The port tank is really a ‘cheek’ tank and will supply fuel to the Hurricane heater. Therefore the best location for the Hurricane is on the port side. The red line denotes the division between the two tanks. Tank ‘A’ is the main tank and Tank ‘B’ is for the Hurricane heater. The next task was to whip-up some courage and attempt to drill and tap a 4mm thread for the four machine screws that secure each of the four fittings (3 diesel & 1 water). In the end the fitting went rather well. One of the engineers then loaned me the “caulking gun” which I used to apply construction adhesive around the base of each fitting. Each fitting was then screwed down and the excess adhesive wiped off with white spirits (or stuck in my hair). If I’ve done it correctly we should have a water tight seal. Ha Ha, I can't resist. I thought at first it was some new specialist engineering device. Then I realised - "caulking gun".